Butterfly bushes or Buddleia, are known for how they attract butterflies and hummingbirds. But they evidently attract other birds too. 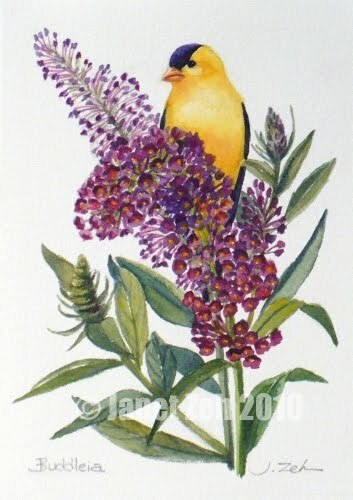 I was quite surprised this morning to see a yellow finch on one of my butterfly bushes. He was enjoying some of the seeds from a spent flower. It made such a stunning picture that I decided to paint it! The original has been sold, but check my Etsy shop for more of my bird artwork. Thanks for stopping by today!